“My uncle is not yet home from work,” said the stocky man on the porch. The three little girls who had scampered into the house when I said hello to them must have warned him of Murugan and mine’s arrival. Now they peer from behind his splayed, salwar-clad legs as he stood cross-armed guarding the home’s entrance. I mounted the steps wondering why the Mr. Bhadana was not here when he was supposed to be home sick and tried to catch Murugan’s eye to shoot him an upraised eyebrow, but he kept his head low as he followed Dinesh over the home’s teal-colored threshold. Dinesh, however, did not keep his head low or his eyes off me once we were seated on a charpoy in the home’s main room. It is not that I did not know I looked a fright, else why would the little girls have run away in terror when I spoke to them, but I did not think my appearance warranted the flat-out stare Dinesh leveled at me. Sure I wore a mishmash of Indian and American clothes, the top half purchased at a bazaar in New Delhi’s south side, the lower half mail-order hiker’s pants and Vasque boots. And yes, my short hair stuck straight up like high-five hello. But I did not appreciate the fact that he was drilling me with disapproving looks of my appearance. Looking unfeminine is a casualty of riding a motorcycle in temperatures that clawed their way to well over 110 degrees. And I am not even going to guess at the heat index. Two teen girls in floral salwar kamizes clutched each other’s forearms as they whispered and stole glances at me from the corner. Through slightly parted curtains that sequestered the kitchen – where women worked – from the rest of the house, I spotted the little girls who had run away. They hopped around two women squatting on the floor dicing potatoes and onions, begging the women for nan. I guessed, based on their clothes and my knowledge of Indian culture, that the women were a patriarchal mother and daughter-in-law. The older woman, frail around the waist and shoulders, but with hips wide from bearing children, wore a white sari and a clatter of thin silver bangles swaying from each of her reedy wrists. The lack of color in her sari told me she was a widow. The younger woman’s hands were old for her years and a plait of hair trailed down her spine to her waist, thick as a horse’s tail. As I studied their work through the slit in the curtains, the younger woman caught me looking at them and pulled her pallu across her face. I turned my attention back to Murugan and Dinesh. They had been talking in Rajasthani, in a tone that made them sound like secret agents, but when Dinesh saw me looking at him he switched to English. I did not understand what he was implying. Did he think Murugan had trolled the streets looking for someone to pose as an imposter owner of the bag in order to claim it and split the goods? Or was this his tactic to keep the contents of the bag? Nothing made sense. If Murugan had wanted the contents, he could have kept the bag. Or, maybe not. Maybe sending the bag home with the bus driver for safekeeping had not been Murugan’s idea as he claimed. Maybe there was something going on I did not know about. “I can identify every item in it,” I said. This was possible the worst thing I could have said because splotches of crimson inked across Dinesh’s face like a Rorschach test. Murugan, suspiciously silent and perched on his end of the tapestry-covered charpoy, continued to look down. I was really perplexed. Something was most definitely going on, and something had most definitely been implied. “My uncle will be home soon. You can speak with him then, but I will get your bag now,” he said. He said this without making any attempt to actually get the bag, so I decided to describe the contents any way. When I finished, a small smile lifted one corner of his cherubic face and he rose to retrieve my belongings. I appreciated his careful, suspicious manner, and was glad he guarded my possessions with healthy distrust. And I thought the matter was settled now that I had identified EVERY single item in the pack. Hmm, that is what I thought. Dinesh returned to the sitting room with the bag and I carefully extracted all the contents and examined them. “I can’t believe nothing broke,” I said pulling the goods from the purple pack. The camera and lenses had been stuffed into a padded camera case that protected them in the fall. And, I supposed my slow speed plus the short fall to the ground secured the items even more. Dinesh and Murugan watched as I removed the Swiss knife, compass, and journal from the bag. Their eyes press me as I flipped through the pages of my private thoughts and I hoped no one had read them, although I rather doubted that. Murugan and Dinesh no longer conversed in their secret language – secret to me since I did not speak Rajastani. Now they simple watched me. The silence became heavy, as if an elephant had entered the room and every one was pretending not to notice. Needing relief from the silence while waiting for Mr. Bhadana to return home, I asked about the family. A polite thing to do in any culture. “My father is one of three brothers who shares this house. We are eleven children, our mothers, and my grandmother,” he said, waving his trunkish arms around the two-story cinder block house. He sold tribal jewelry. “Would you like to see?” he asked. Before I had a chance to answer, Dinesh was up the stairs and back down again carrying a large cardboard box full of silver. The goods were chunky and very tribal, just the kind of stuff I would have loved to buy if: A.) I was not living out of two thin panners and a small carryon bag; and B.) if I was not at the beginning of a very long journey. But now that Dinesh had spread the goods before me in a salesman like manner, I felt in a position to show gratitude for the care they gave my belongings. As I searched for something small to buy, someone opened the front door. As soon as he entered the house, brief introductions were made and we were escorted from where we had been sitting to a private room at the front of the house. 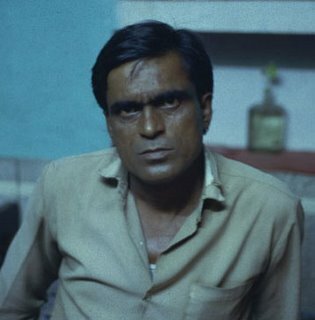 Under the fluorescent tube’s light screwed into the Krishna-blue walls, Mr. Bhadana’s (pictured below) sallow face showed little expression. I perched on the rail of this room’s charpoy while Murugan stretched himself out at the opposite end. Dinesh ordered one of the teenage girls to bring a cane-bottom chair in for Mr. Bhadana, while he himself leaned against a corner of the room and filled his uncle in on the events of our arrival. Mr. Bhadana – a small, dark-skinned man – remained silent and avoided eye contact with me as he listened to his nephew. As soon as Dinesh finished, Mr. Bhadana began to speak rapidly in a strangled tone. It did not matter that I could not understand the words he spoke, the meaning was clear: he was upset and nervous, and it had to do with me. I looked first to Murugan – who had bolted upright when Mr. Bhadana spoke – and then to Dinesh for a translation. “He has been most nervous having this bag in his home,” Dinesh blurted. No longer the happy lizard at the opposite end of the charpoy, Murugan’s eyes grew big as Dinesh spoke. I did not get why Mr. Bhadana was upset. I was the one who had lost everything. Whatever was going on, no one was explaining it to me. Murugan spoke softly in Rajastani and the three of them carried on a conversation as if I did not exist. As if I were not the one who’s lost bag had started this ruckus ball rolling. Mr. Bhadana waved his hands, continuing to talk over my attempted apologies, his voice edgy with distress. This was excessive, I thought. After all, I had come for the bag and now everything was fine. I tried telling them this but no one listened. I looked to Murugan for an explanation but he would not look my way. Now they had me. I had already detailed everything that was in my bag and I knew nothing of what they were talking about now. The three did not look at each other or exchange words. They simply continued to watch me, dissatisfied with my response. So I did the only thing I could do, I flung the same question at them again. Murugan had received some sort of telepathic permission from Dinesh and Mr. Bhadana to be the one to take the lead in this investigation. He reached into my camera case and removed a muslin pouch containing pink crystals. Mr. Bhadana scooted to the edge of his seat and Dinesh stepped out of his corner to get a closer look. Now it all made sense. In a second, I made the connection to what they were thinking and at the same time almost laughed out loud – from my perspective – at the ridiculous nature of their thinking. They believed the small pouches of silicon I carried, to help absorb moisture away from my camera, was some sort of drug. Smuggling – of all sorts of things – was an economic reality in India. I explained what the silicon did and the three of them looked as if they had been popped with a pin. Laughter erupted and Mr. Bhadana’s relieved expression at learning he had not been harboring the goods of a drug smuggler for three days is something I will remember for the rest of my life. “Chai. My uncle says we must have chai to celebrate,” Dinesh said, laughing as he barked orders to his nieces who had hung by the door listening whole time. The two teenage girls carried in steamy cups of fragrant chai. Our china clanked as we joked about the misperception and a wave of relief melted over me. Before setting out from New Delhi on this journey, I had been repeatedly warned of the dishonest people I would encounter along the way. Warned of the dacoits – highway robbers – and cheating hotel managers and storeowners. Warned that I would be taken advantage of because I was a foreigner and a woman alone on the road. But the pervasive dishonesty I expected had not materialized. Instead, I had met a man who despite his discomfort with keeping what he believed to be illegal drugs and despite the fact he could be in a lot of trouble for keeping those “drugs,” he had done so because they belonged to another and it was his duty to keep the belongings of another safe and return them to the owner. We were, in that moment, two people who had wrongly perceived the each other because our expectations were based on blanket perceptions of the other’s culture. I was torn between wanting to stay and wanting to get as far away from him as I could because he represented something in me that I did not like. I folded several hundred-rupee bills and shyly handed them to Mr. Bhadana. (I would do the same for Murugan once we were away from the house.) Mr. Bhadana glanced at his nephew before extending a dry hand to take the money. I was grateful to him for taking care of my things and wanted to express it, but I admit to being unsure if I gave enough. The misperception we had had already left me floating in a sea of uncertainty as to what was right and proper. I quickly said good-bye to the family and scurried out the door, Murugan on my heels. On the way back to Pushkar, Murugan and I stopped at a local restaurant along the road. We faced each other in a booth, sipped cola and ate chow mien. We laughed over our shared experience of finding Mr. Bhadana, the rampaging cow, India’s intricate network of communication, and even the odds of Murugan finding me. He was a shy young man when he had first approached me, but that was hours ago and through the afternoon’s experience he had changed. He briefly put his hand on my knee under the table, he tousled my hair, he touched my arm, the gestures were fleeting but they added up to an uncomfortable familiarity. My back stiffened. He gave me “a look.” I knew in that instant I would be out of Pushkar before dawn. I have been following your trip since you started. Its so exciting. One day I would love to explore INDIA like you. Wish you all the best for your trip around INDIA. We once forgot our Bag in a Cycle Rickshaw. It had some Jewellery, Cash and Documents of some Investments. It was all gone. Two days later we were contacted by the Rickshaw Puller who found us from one of the documents and asked if we lost something. We got all the valuables back from a person who could easily buy a piece of land back home. A cash reward too was declined and this is Delhi with no pouches of Silicon!! i think u r a super woman, u go girl!!!!!! !